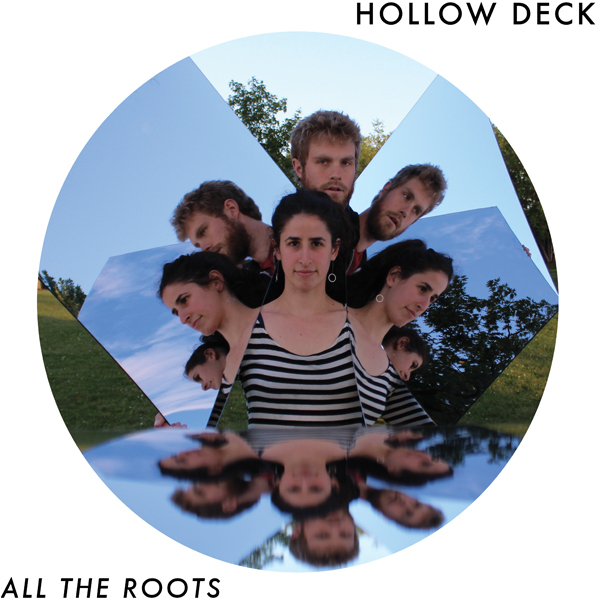 “All The Roots” is THE album by Western, MA’s Hollow Deck released by Feeding Tube Records. The duo comprised of Mia Friedman and Andy Allen are coming to transport your hearts and minds at Dorchester Art Project on Jan. 25th ($10, All Ages, 8pm). I beg you, don’t stay in on a Friday night wondering what new experience you can attain. This experimental folk duo is the jam. If the bird-like beauty of a Joanna Newsom melody melded with a library of bombastic noise, electronic drums, strings, horns, and dissonant sweeps of clucks unknown, you would get somewhere close to “All The Roots.” Familiar and soothing folk singing in unfamiliar landscape creates a slew of possibility always leaving room for the listener’s personal experience to dawn meaning. Order the wax on Feeding Tube Records (limited run of 300). 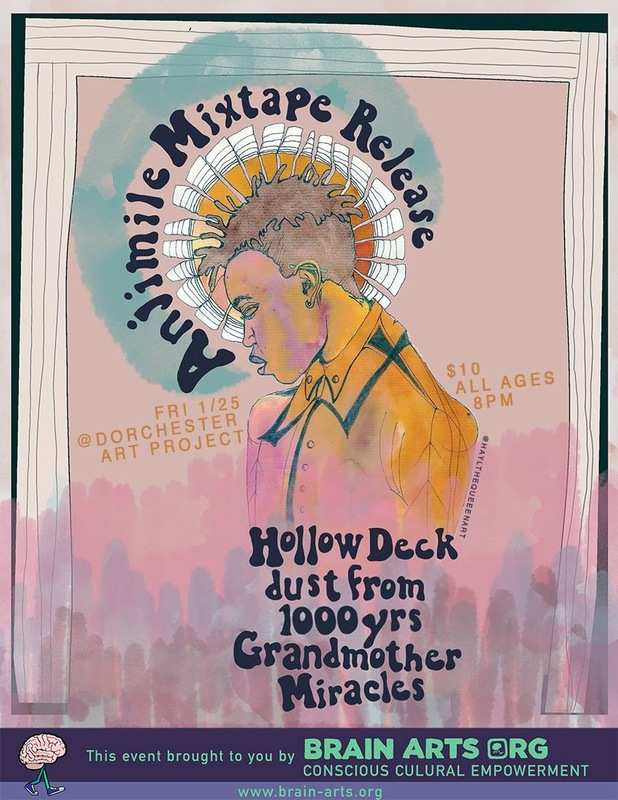 I caught up with the duo to rap about the record and the upcoming live show at Dorchester Art Project on Friday, January 25th. More info on this show here. Boston Hassle: “Cumquat,” the last track on the record. Any chance you could expound on the connection between the title and the lyric “I want a forest”? Hollow Deck: This was mainly a stream of consciousness song that kind of turned into a song about losing hair and coming to terms with that. The forest is subtly about a forest of hair. Boston Hassle: At the DAP show on Jan. 25th will you be playing “All The Roots” in its entirety or are you playing newer songs as well? Hollow Deck: We will be playing some songs from “All the Roots,” a song or two from our first record “Hobson’s Choice” and a few newer ones. Boston Hassle: You recorded “All The Roots” live for the most part? How much do the songs change when you do a show in front of an audience? Hollow Deck: The album was meant to capture what we really sound like in a live performance, and I think for the most part it does. However, it was recorded more than a year ago. Over the last few months, our live performances have been a little different. We’ve been playing sets with fewer breaks between songs and a higher percentage of improvisation/sound collage. Improvisation has become like the glue that holds everything together, as opposed to something that we do primarily within the world of each song. Boston Hassle: When you’re playing in front of an audience is there a desired effect? Do you want people to weep joyfully, be slightly disturbed, think something, feel something? Hollow Deck: The thing I’ve (Andy) always loved about abstract or partially abstract art/music/film is its ability to be interpreted differently by the individuals that consume it. There is no one correct reaction or interpretation, which gives it the ability to feel personal to the viewer/listener. As listeners, so much of our experience is based on our own unique mental/emotional/physical/spiritual history with listening to music and where the current music being consumed fits in or doesn’t fit into that understanding. Boston Hassle: How the heck do you execute all of that instrumentation with only the two of you? And how do you do it at the live show, is there a compromise on gear? What’s your setup like? Hollow Deck: I (Andy) have a “noise table” with a mixer, tape players, a drum machine, and some effects pedals, a pile of tapes and some recorders and bamboo flutes. I also have a saxophone, clarinet and flute setup on a stand. Mia has two microphones, one for vocals and the other for violin or banjo depending on the song. Her microphones are plugged into my mixer so I can manipulate her sounds with my effects pedals, or choose not to. We like having the option to create dense soundscapes in order to complement the thinner textures we also use so that we have more options as a duo. Boston Hassle: When you write songs what is the initial spark like? Is there a common starting point or do ideas come in all directions given your large array of instrumentation. Hollow Deck: For me (Mia), the initial spark is usually a short melodic phrase with my voice and one instrument (often banjo). Words come later, stemming from a stream of consciousness. Then we take the bare bones of the song and arrange it as a band. This often features strong improvisational leanings, though it sometimes includes more specific parts that we come up with together, record, and remember for live shows.